Daniel T. Brooking is a native Washingtonian. His first art instructor was his father, Daniel H. Brooking. He remembers being surrounded by paint, pastels, charcoal, pen and ink and clay. Early on he was introduced to the magic of art. As a child he thought everyone knew this magic. He was taught to "see" the world and the possibilities of beauty within it. He soon learned that not everyone could "see". At Anacostia Senior High School he had the privilege of receiving training from Phillip Ratner who introduced him to new artistic challenges. Over 40 years later he and Phillip Ratner were reunited at the Dennis and Phillip Ratner Museum where Daniel curated two exhibitions. Daniel follows the spirit of Sankofa, reaching back into the past to find a memory, bring it forward to inform his art and make it new. He is fascinated by masks and their place in traditional cultures as well as the "masks" we wear everyday in our modern world. With the imaginative aid of the computer, he produced a series of original masks. His masks represent a pantheon of gods and goddesses both benevolent and sinister. They have been influenced by his travels to Africa, Asia, South America, the Caribbean, the Middle East and the American west. Daniel also enjoys creating abstracts, often starting with the same image but using color and light to develop different perspectives and moods. To him art is more than a technical skill. He often says "First of all, I do this for me". His work is very personal. It is not consciously meant to follow a particular school or style. Color and light or the lack there of present an opportunity to find something hidden, coaxing the viewer into a second look, to find the story, to "see". His work allows him to open doors in his mind and communicate with his dreams; to make hard copies that he can hold and evaluate. He is searching for a new road and not afraid of all the side streets he may take to get there. He gives presentations to aspiring high school and college art students.. He instructs the students in the business side of art, about the life of an artist and about the influence art has had on his life. He has exhibited locally, nationally and internationally. He has served as a curator and juror and also as a grant panelist for the DC Commission on the Arts and Humanities. Daniel is a member of Black Artists of DC (BADC), its Archivist and a member of its Summer Bridge training staff. He is also a member of the Washington Project for the Arts (WPA). 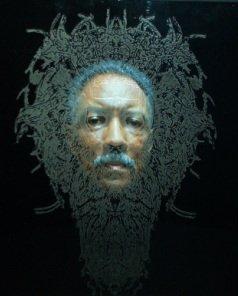 His art was chosen for the NCA 50th anniversary exhibition which also included DC chapter members and David C. Driskell, Claudia Aziza Gibson-Hunter, Willard Taylor, Norman Parish, E. J. Montgomery and NCA founder Dr. Margaret T. Burroughs. Daniel believes "Artists should never limit themselves to a particular genre; learn as much as you can, do as much as you can and never stop". Daniel's work is represented by Jeannette Mariani, Galerie 13, in Paris, France.